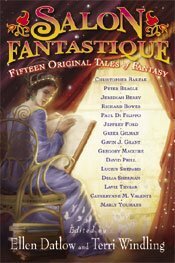 The anthology Salon Fantastique, edited by Ellen Datlow and Terri Windling, is now available to be purchased online and in bookstores. The anthology is getting great reviews, so I can't wait to read all the stories. I haven't received my contributor's copies yet (my story "The Guardian of the Egg" is included in the contents) but I can't wait to because the cover looks fantastic from what I can see. Check it out. Cover looks awesome in the thumbnail, but clicking on it brings up a jumble of text. Is that just my incompetence? But it does look like you're top of the bill. Damn you people with your early-in-the-alphabet names! Couldn't you publish under the name Zakbar? Yep, that works. u r geenuis, as I believe the young people say. Early alphabet authors generally have a sizable advantage over "alphabet dead enders" as they're called. Chris' name actually IS Zakbar but at the start of his career he changed it. Well, that explains why Brian Zaldiss did the same. And, of course, there was the famous incident of Martin Amis when he was very young announcing that he was returning to the actual family name of Zima which his father had abandoned for several good reasons. He soon changed his mind.